Can we find a social solution to this capitalist mess? Image courtesy of the Socialist Organizer. My recent return to southern Belize has been a pleasant and productive revisiting to a place where I spent nearly a year and a half working on my dissertation research in anthropology. I've written much about this place and Belize more generally, and while I am plumbing the depths of my experience here in an effort to complete my dissertation, I continue to find inspiration for shorter musings and reflections. One such experience occurred the other night while I was having some drinks with some non-Belizean friends of mine. We were out at a local seafood restaurant, popular with expats and tourists. It's a place with good food and character, an old wooden building sitting on stilts out over the Caribbean Sea, with a large outdoor deck perfect for star-gazing and enjoying the cool sea breeze. It's also the center of social life for the younger ex-pat community, where you can run into any number of young foreigners, here doing research, volunteering or interning at local NGOs, or working in efforts to relocate to Belize. I was there with some archaeologist friends, one of whom I did my Master's schooling with, and some researchers who work with a local conservation organization, talking about different issues that come up in the world of "development." Soon, a mutual friend walked up to say hello before leaving for the night. She runs a local company that helps to produce and export agricultural products, and has helped to develop a program that sources the product from local farmers, and connects them to "ultra-premium" producers in the US and elsewhere. It's a model in the vein of fair trade, and provides farmers with a decent price for their product, and more importantly to some, introduces a level of competition in a field that was previously dominated by one company that dictated prices and terms to the farmers. We asked her how her business was doing, and before long, I was engaged in a short conversation with one of the conservation people I was sitting with. "Her company is doing great work. It was such a good development for Toledo," said the conservationist who had been to Toledo a few times in the last three years, but never for more than a couple weeks at a time. "How so?" I countered, knowing that I was going to critique the business. "Well, she has introduced competition in the market here, and that has given the farmers more options, and in many cases, a better price for their product," she replied. These things were true - farmers could now choose who to sell their product to, and at what point in the post-harvest process. Basically, they could now sell immediately after harvest, for a lesser price, or after weeks of processing for a higher price. They now had options, and thus some flexibility, and her business had brought more farmers into the fold, with the increased demand that now existed. "Still," I countered, "This is really just a new face on an old dog. Nothing has really changed. Maybe the farmers are making a little more money, but most farming families still live below the poverty line. They're not being brought out of poverty. And in the meantime, these "premium" producers are making all the money on the end product, and driving their Mercedes' and living in New York City. Really, her business is just reproducing the same old inequalities that have always existed within capitalism. Rich people are making their money on the backs of the poor." "True," she replied, "but what is the alternative?" Just then we were interrupted, and were never able to reconnect to continue our conversation. I fear she was uninterested in talking more, as far too many have accepted the triumph of capitalism, and its seeming dominance of the world economy, and more importantly, social life. However, with increasing problems in the global capitalist system, and a seeming unwillingness for compromise or reform, capitalism has had its weaknesses revealed. Coupled with the fact that, as a recent article in TruthOut explained, socialism has never been realized in its true form, and we are left with the possibility that we let the wrong system win out. With tension rising across the globe, we are seeing protests with growing frequency. And with those protests has come the beginnings of a new process of intellectual exploration. "What is the alternative?" is a question asked in more and more circles, and being answered in ever diverse ways. 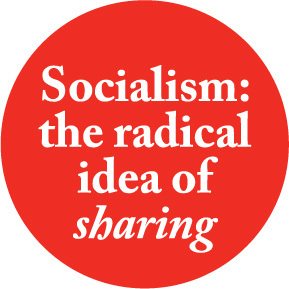 We recently shared one such response, the creative manifesto of Obvious International, and the TruthOut article mentioned above lays out a critical analysis of socialism, and how we could better institute a socialist attempt at organizing society. Below is yet another example of a simple, yet articulate, way to dialogue and move forward with the transformation of society that our current capitalist system is leaving us no choice but to engage. Created for the System Change not Climate Change network, the EcoSocialist Solution is a series of seven flyers detailing why and how we can begin to realize a new world. Drawing heavily from socialist doctrine, EcoSocialism calls for emphasis on the collective, careful planning, and an eye towards sustainability and equality. Read through the very accessible flyers, collected below, and check out their website for more about the System Change Not Climate Change network. More importantly, share, think, and continue talking about how we can move forward as a society - as humans - in a just, rewarding, and productive way. It is time.